The Write Question is a weekly video podcast all about writing. 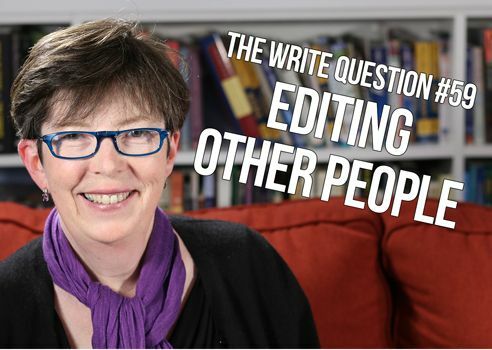 Today’s question focuses on becoming a better editor. If you have a question you’d like me to answer, email me at daphne@www.publicationcoach.com, tweet me @pubcoach, or leave a message for me at the Skype account, The Write Question. Welcome to The Write Question, I’m Daphne Gray-Grant. Today I’m giving advice on how to better edit other people’s writing. Thanks for the question, Frank. I’ve been an editor for more than 40 years now but I can remember what it was like to be edited myself. As a result, I always approach the job with a great deal of care and concern. I don’t think it’s my job to impose my style on the writer. Instead, I think I have a responsibility to help the writer express their own style in the best possible way. Also, I understand that people learn more when they fix things themselves. As a result of these two philosophical choices, I try not to dive into stories — even problematic ones — and start rewriting them holus-bolus. This can be more time consuming, but the benefit is it helps protect my ongoing relationship with the writer. They don’t see me as desperate to put my voice in their stories. They know I want to help them become better. Most writers would prefer to fix their own problems rather than have someone else sweep in and take charge. To answer your other question, yes, the best way of editing today is to use “track changes” in MS Word or in Google docs. But here’s one other specific tip to keep in mind. Never use red ink. Many people have been terrorized by high school teachers and have a negative visceral reaction to red. For that reason, I always use purple or blue. As an editor, your most important job is to help your writers improve over time. This is far more crucial than the excellence of any given story. You want your writers to become more skillful and more confident. You don’t achieve this end by ignoring problems, of course. But if you simply rewrite every story to your own taste, the writer won’t learn to improve. Frank, if you can teach yourself to become a coach and a mentor to your writers, you’ll be doing them a huge favour and you’ll get much better work from them in the end.